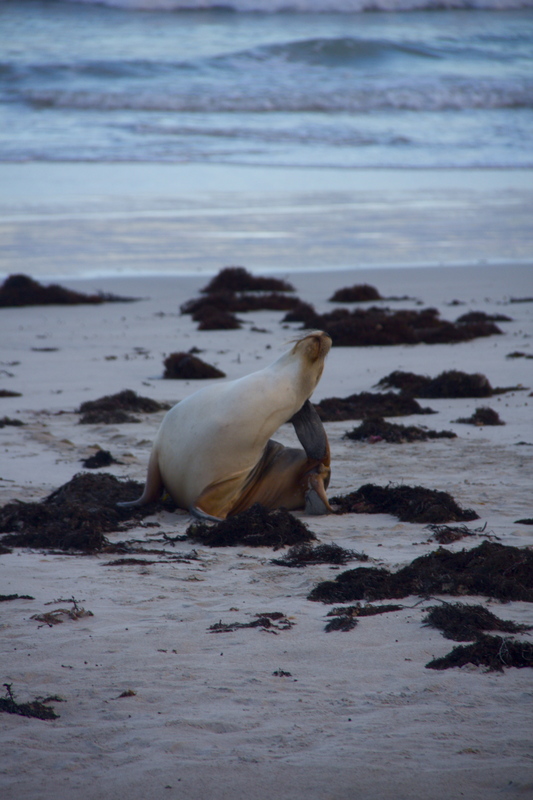 After our Great Ocean Road adventure, Cheyenne and I made our way down to Kangaroo Island, accessible by a bus/ferry from Adelaide. We got to the island around ten am on our first day and rented a car, then headed out for the day. 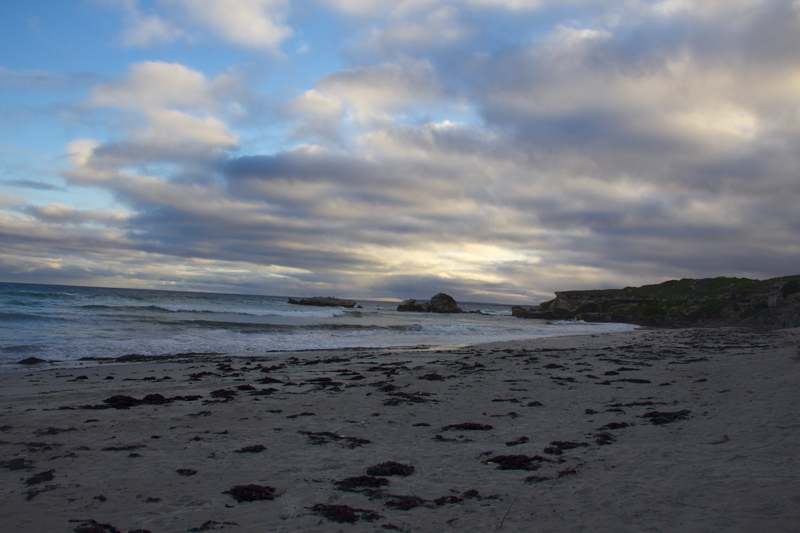 Our first day was unexpectedly bright and sunny, so we decided to take a drive partway down the southern coast. We happened upon our first stop by chance on a wrong turn, ending up at Clifford’s Honey Farm. We did a quick tour of their back room and one of their hives, then perused the gift shop. This tiny little store had honey-themed everything, and offered free honey tastings of six or seven of the varieties they sell in store. Unfortunately I’d just bought honey in Melbourne, but I did snag an all-nautral non-petroleum based lip moisturizer and an awesome strawberry scented bar of soap. We were encouraged to stop by the eucalyptus distillery, and we got there a little bit before it closed. It was pretty empty and not all that interesting, so unless the history of eucalyptus oil is something you’re really into, I’d give it a pass. They do have some cool eucalyptus based products, but they were definitely on the expensive side and could be found for a better price elsewhere. Our big stop for the day was the Raptor Domain, which I would highly recommend. Raptor Domain features shows at set times, and the shows are the only way that you get to see the animals. 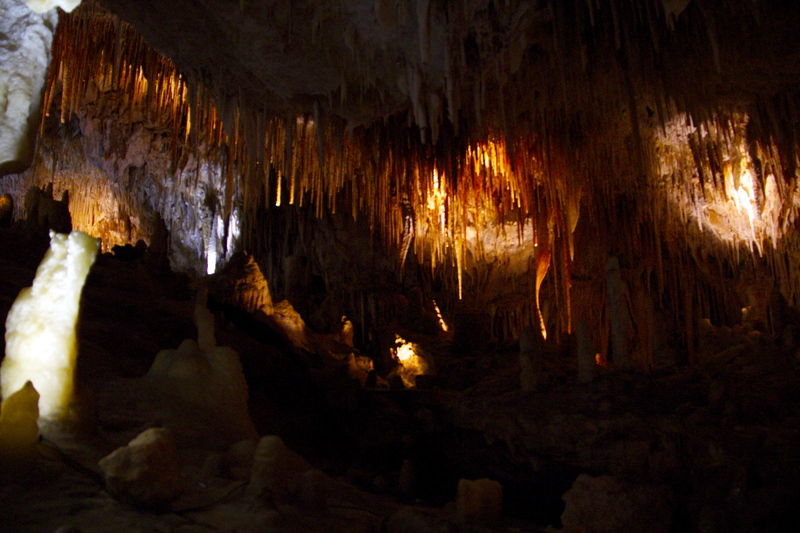 They’re very reasonably priced and you can pick and choose which ones you want to do, and the two that we did were very interactive. 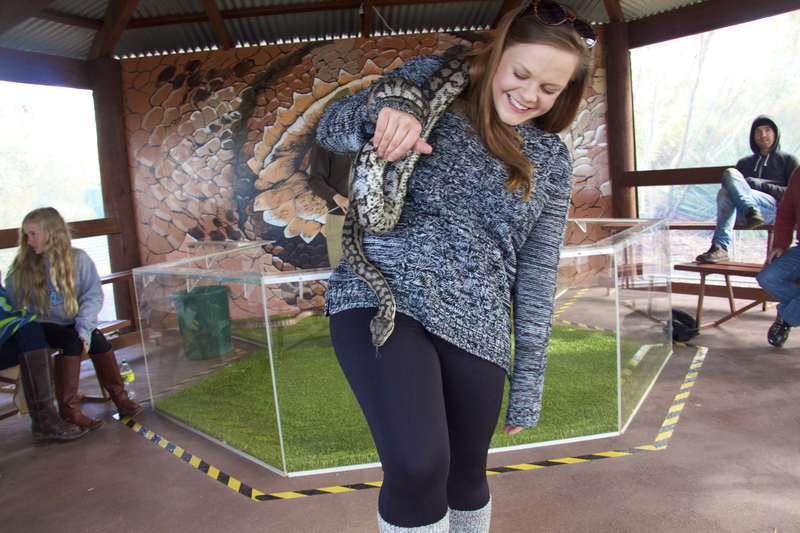 We got there just before the reptile show, which features blue-tongued lizards, skinks, and a few different varieties of snake. We were told a little bit about each species, instructed on how to handle them, and given the opportunity to hold or touch most of the species. 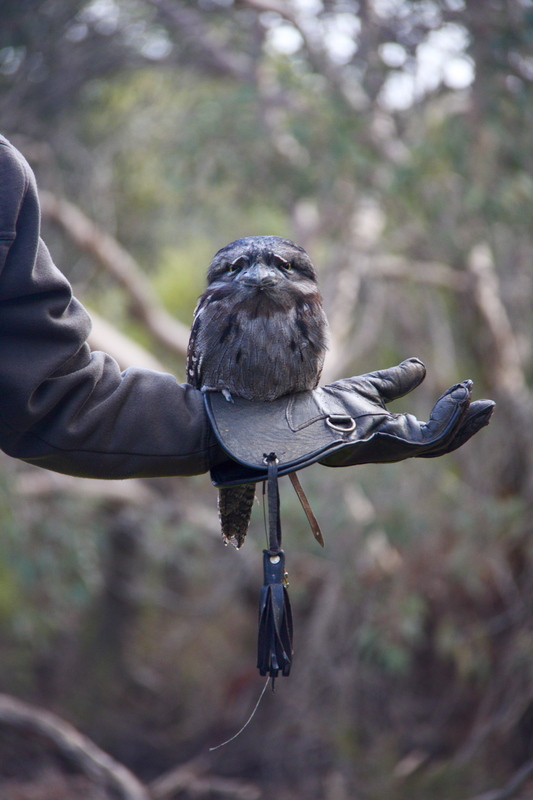 The next show we attended was the birds of prey show, which featured two different types of owls, an eagle, kookaburras, and a few other birds as well. 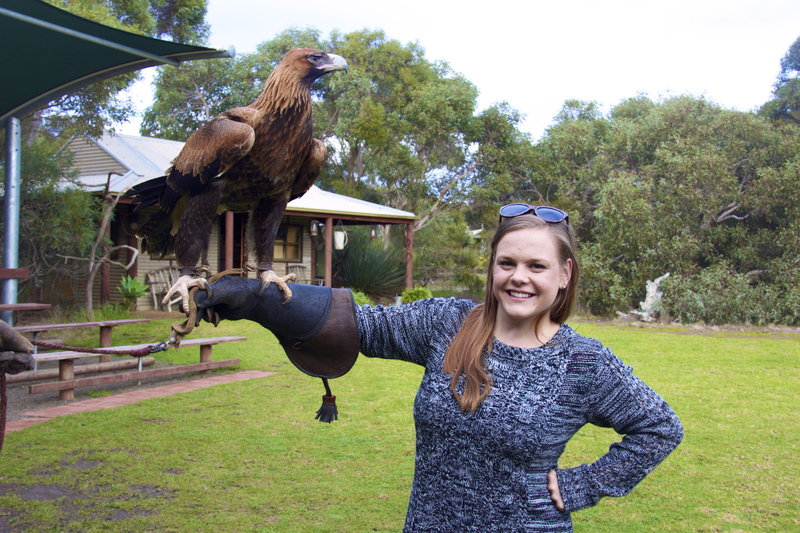 A $10 donation allows you to hold one of their juvenile eagles, which was a pretty nifty experience. The rest of the bird encounters were included in the show. We finished our day with the last tour of Seal Bay, where a guide escorted us down to the beach to observe their seal colony. For about half the price we could have only walked the boardwalk, but opted for the tour and were not disappointed . 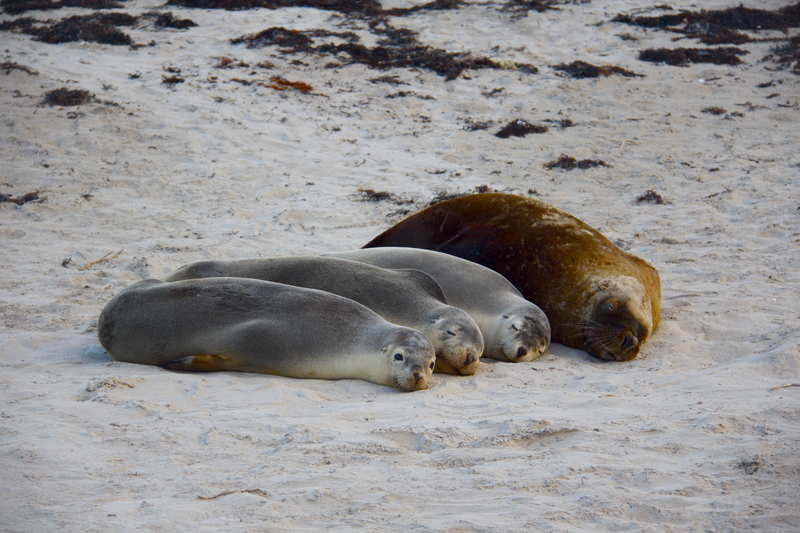 The beach itself is beautiful, and the seals were very cute and in their natural habitat. 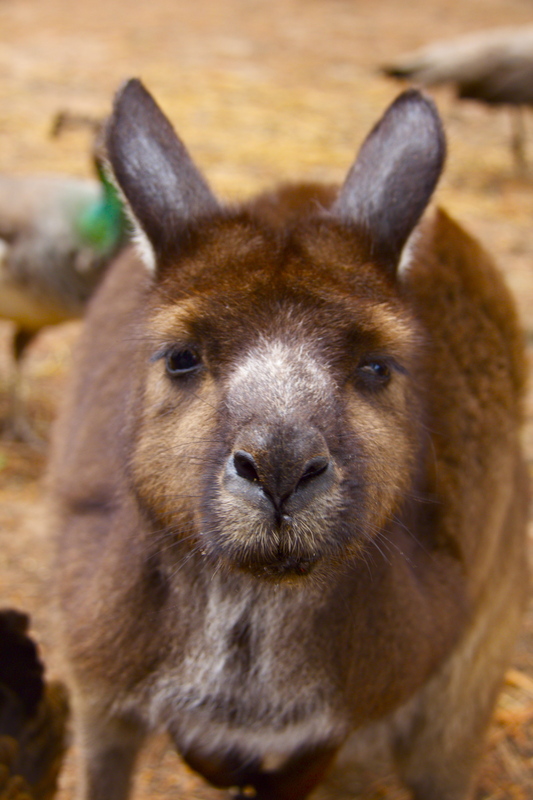 On our second day we went to Paul’s Place, a family-run wildlife park that houses a number of kangaroos, emus, an African deer, a koala, two echidnas, birds, reptiles, snakes and an injured baby possum. The park only admits adults (18+) due to their insurance, so this wouldn’t be an option for those with younger kids. It was an amazing experience as an adult, though, and it was nice not to have to worry about having young children around. Admission to Paul’s Place is only $15, and it costs and extra $3 to hold their koala, Lou. Our tour started with Paul enthusiastically asking who wanted to feed a kangaroo. 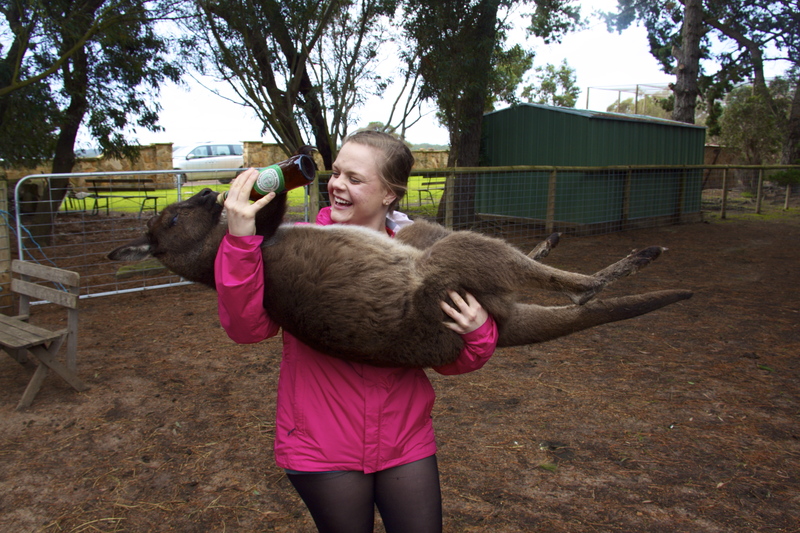 I volunteered immediately and was pretty surprised when he pulled out a converted beer bottle (full of a kangaroo-friendly substance!) 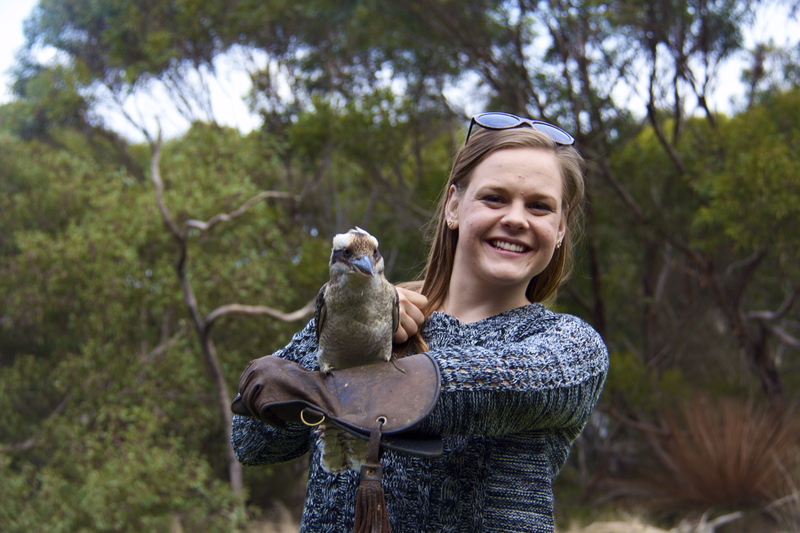 and plunked one of the roos into my arms like a baby. After that we were given some barley to feed to the animals. Unfortunately the emus didn’t seem to know their own strength and tended to peck aggressively at your hands to get the food, which was more painful than it was pleasurable. 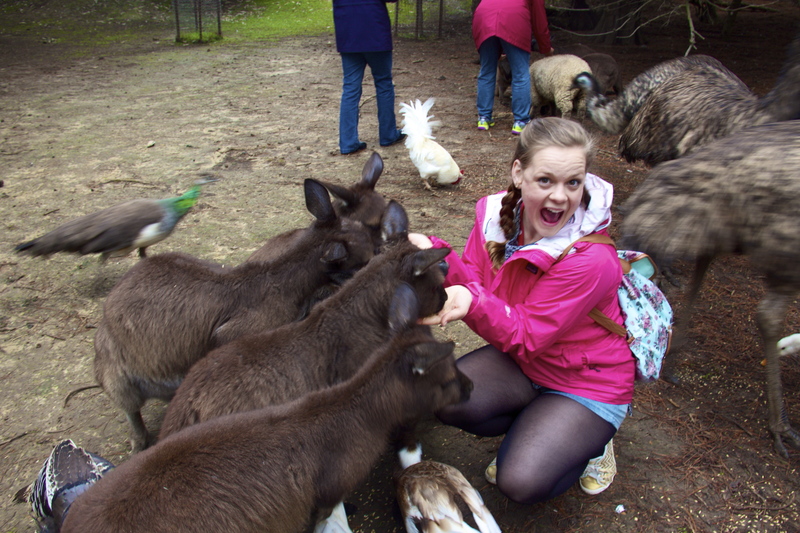 The kangaroos were all very docile, though, and we had a lot of fun frolicking around with them. 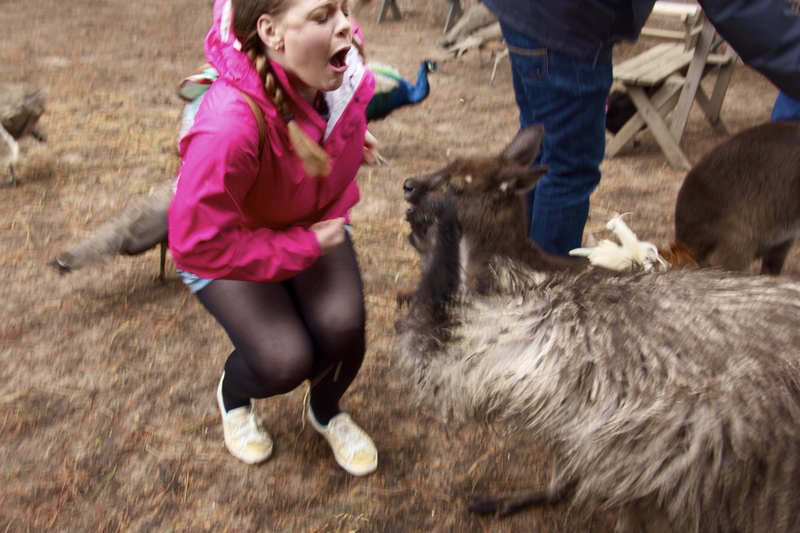 I was 100% not kidding about the pain of being pecked by an emu. 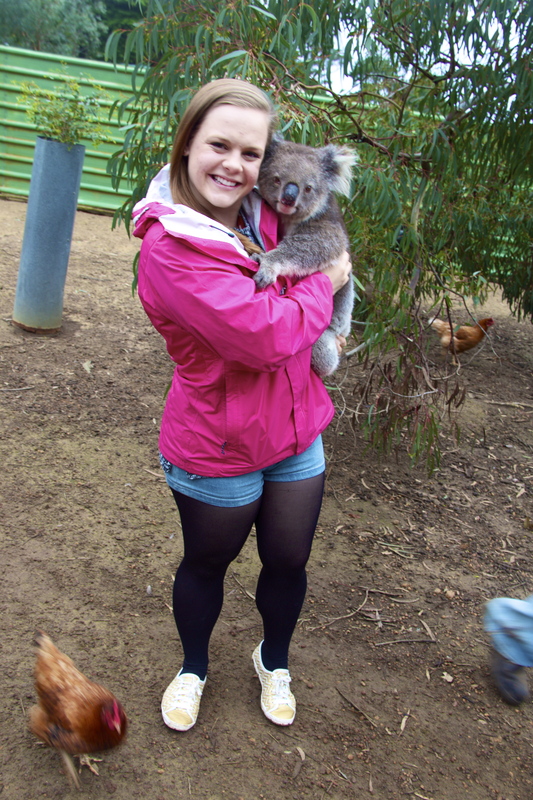 After the roos we were led into another yard and got to hold the Koala, Lou. Lou was an orphan and has been with the park for six years, and was more than happy to cling on to all the excited tourists. We were also given the opportunity to cuddle an orphaned baby possum, which was adorable and tucked into a soft blanket, snacking away happily on almonds. 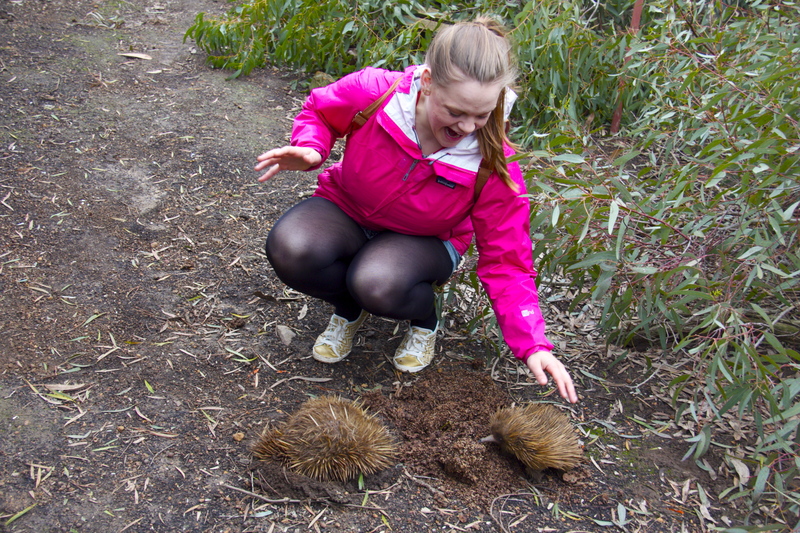 After the koalas we were taken into a large, fenced-in area, which held the two echidnas and all of the birds. Paul coaxed the echidnas out with some larvae, and we were allowed to pet them gently as they munched. 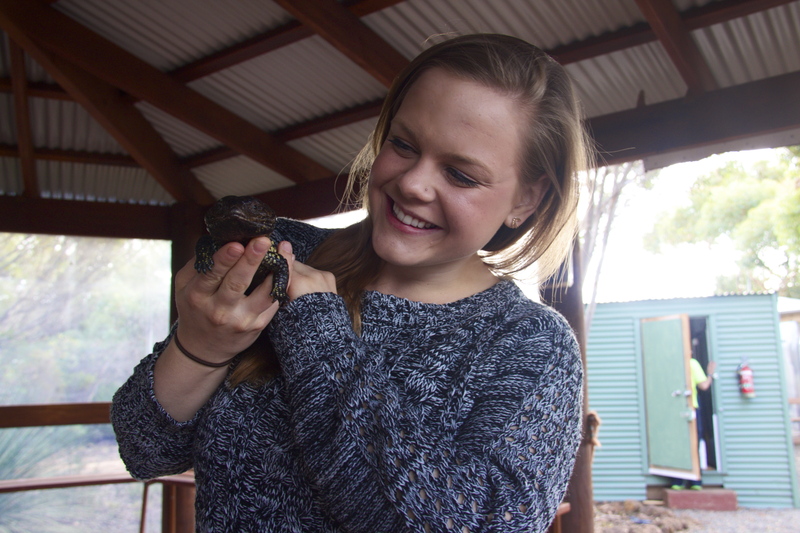 Our last part of the tour involved the reptiles, and Paul’s wife and kids carefully passed around the reptiles. 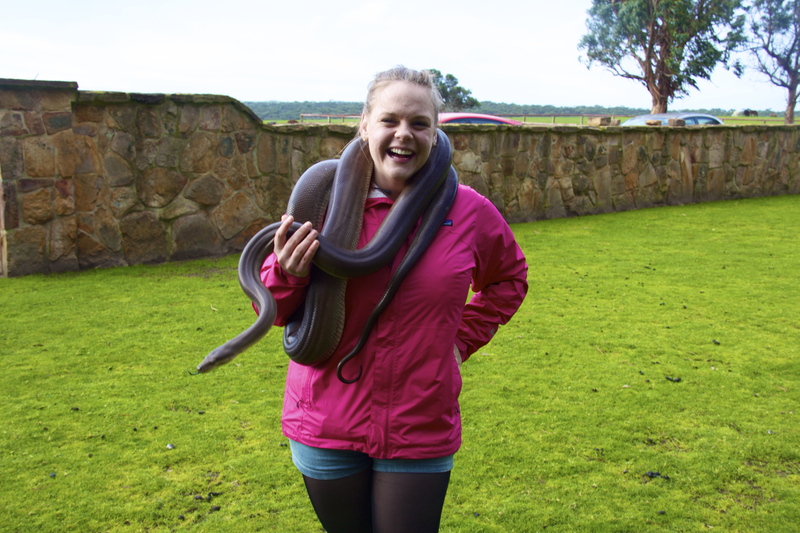 The highlight of this section was definitely the massive snake that he had, and which we were invited to hold if we were up to it. 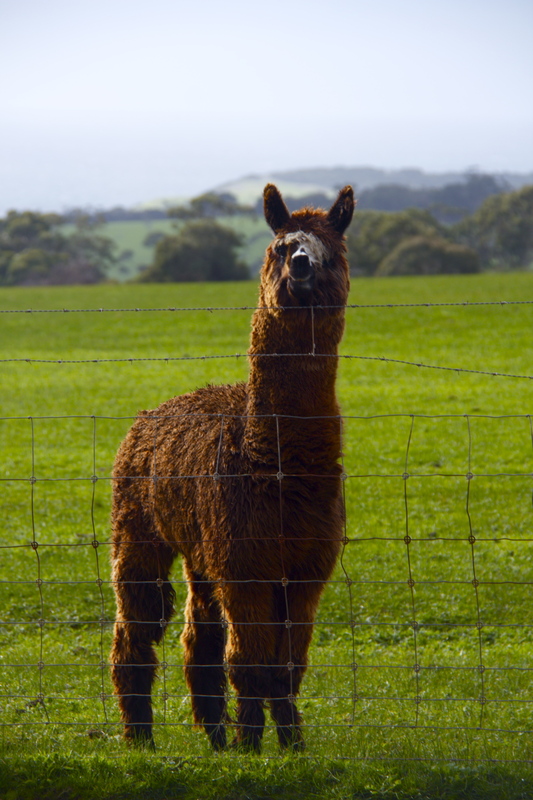 We were seen off by an excitable alpaca, and headed back to our town for some dinner. 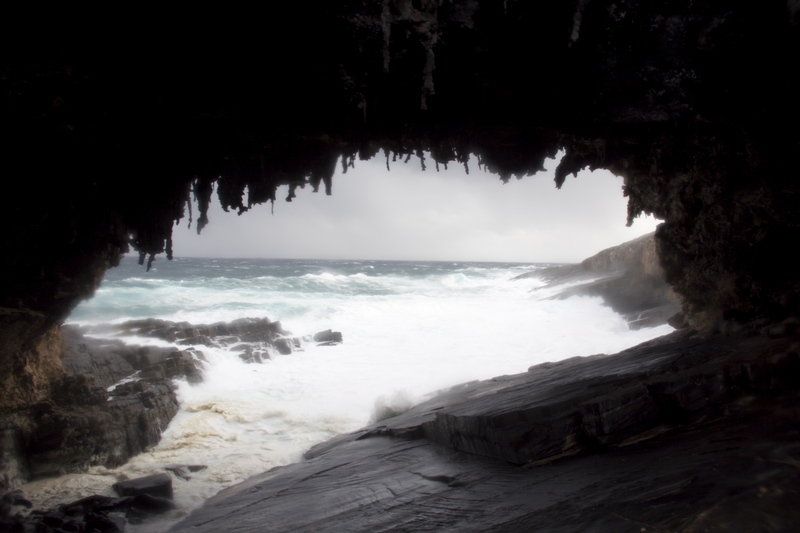 Our last day was more of a half-day than a whole day, but we set out early enough and managed to check out the Kelly Caves and Flinder’s Chase, which is definitely the most photogenic part of the island. 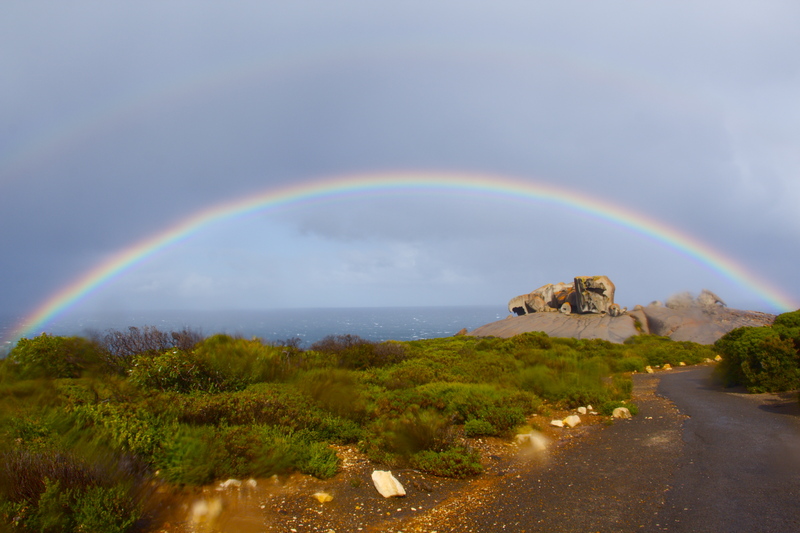 Even though the weather was pretty rough, we managed to check out the Remarkable Rocks, which were, in fact, pretty remarkable, and were lucky enough to see a double rainbow over the rocks on our way in! 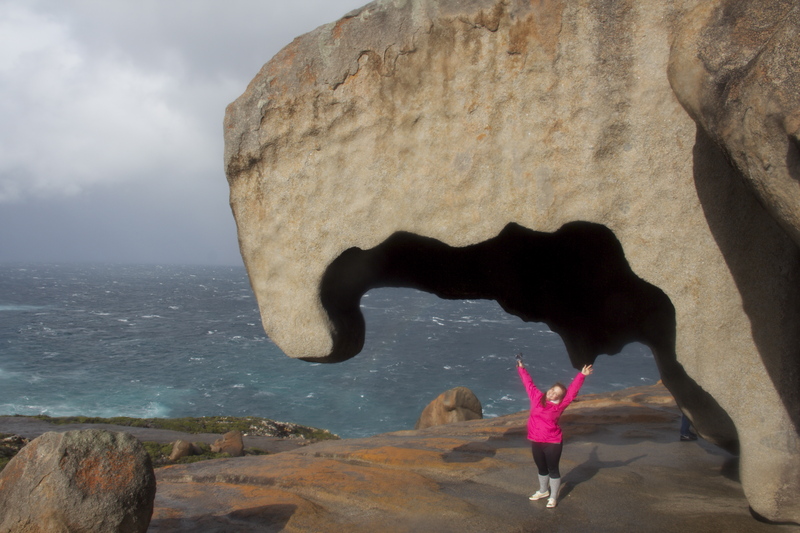 We payed the price for that little bit of awesome in the form of a freak hailstorm cropping up as we were on our way out, but the weather held out long enough for us to explore a little bit before we ran back to the car. Walking down to the Admiral’s Arch felt a little bit dangerous in the winds, and on my way up I nearly got blown off the boardwalk. It was worth the struggle, though, and I snapped a few quick photos of the arch before I scurried my way back to safety. 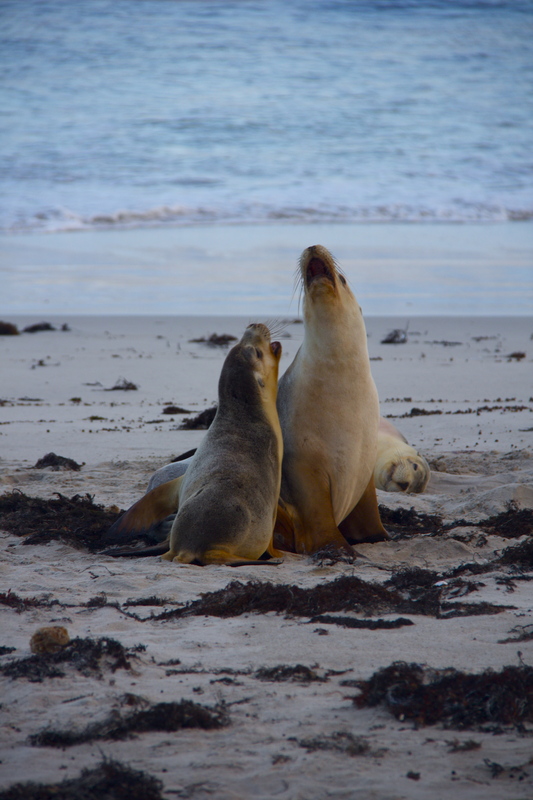 I made a short pit stop by the fur seals, which had a few adorable and playful pups who seemed unfazed by the snappy weather. We left Flinder’s Chase around 1:30 to return our car to the ferry port by 3, but our plans unfortunately took a hit when we were told that all ferrys were cancelled for the day due to the weather. We were a bit bummed but made the most of it by treating ourselves to a great steak dinner, wine and some gluten free chocolate cake!